Express your love for each other with a timeless design cast in pure Sterling Silver. Couple's ring features his-and-her square-cut Austrian crystal birthstones accented with a genuine Diamond. 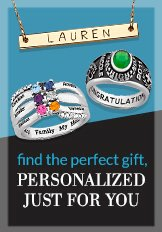 An elegant keepsake she will treasure and want to wear forever.Personalize with 2 names, up to 10 letters each and corresponding birthstones.